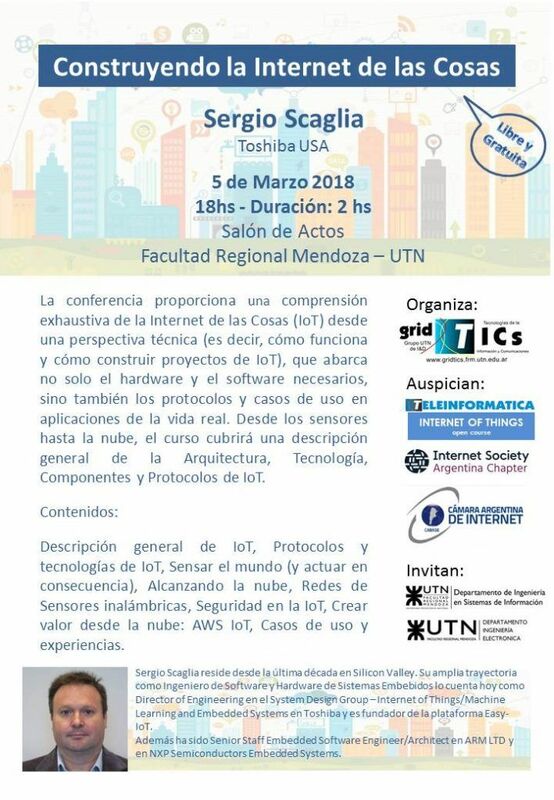 On March 5, 2018, the "Building Internet of Things" Conference will be held at the Mendoza Regional School - UTN. The speaker is Ing. Sergio Scaglia, founder of the EasyIoT platform, and organized by the R & D GRID-TICS Group of the UTN. Admission is free and open. founder of the EasyIoT platform, and organized by the R &amp; D GRID-TICS Group of the UTN. Entrance is free and open. The conference provides a comprehensive understanding of the Internet of Things (IoT) from a technical perspective (ie, how it works and how to build IoT projects), covering not only the necessary hardware and software, but also the protocols and cases of use in real life applications. From the sensors to the cloud, the course will cover a general description of the IoT Architecture, Technology, Components and Protocols. Cases of use and experiences. Sergio Scaglia has been living in Silicon Valley since the last decade. His extensive career as Software Engineer and Hardware of Embedded Systems counts today as Director of Engineering in the System Design Group – Internet of Things / Machine Learning and Embedded Systems in Toshiba and is founder of the EasyIoT platform. He has also been Senior Staff Embedded Software Engineer / Architect at ARM LTD and at NXP Semiconductors Embedded Systems.